Waiter, what's your soup du jour? The countdown continues to my (indefinite) departure from America to France. The debilitatingly slow French government needs to approve my visa. Anyway, while packing and goodbyes are all priorities, the voyage itself is also in the front of my mind. Most notably, what will I eat on the plane? It’s the all important question. While some flights have toyed with the idea of cutting in-flight meals, along with other comforts, I began to get nervous. I, like many people, look forward to the meal procedure. Its distracting, it takes up time, it requires my attention, and, if you’re on Air France, in involves wine. What a no brainer. The quality of food need not be mentioned. But as I’m flying Air India, I wonder what we’ll eat. Curry chicken? Will there be naan? One would hope. 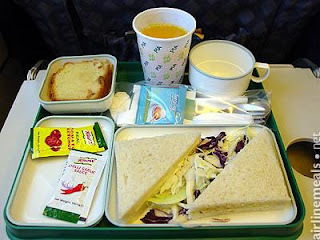 But it’s curious that usually the food on all airlines is the same basic chicken, beef, or fish dish. Does Aer Lingus serve up boxty or coddle? Will Air Maroc dish up some couscous? I haven’t flown quite enough to know, but I can say that most every meal I have ever eaten on a plane could have been served up on any carrier I have taken. Is that just me? Air France did have a French spin, serving individual tiny baguettes and wine, something at Continental or American never did on a transatlantic flight. Why not mix it up a bit? Let the cultural experience begin from take-off! If people don’t like beef goulash and potato pancakes, just serve them up some Jack and Coke, which Air India did for me two years ago. It was the most tranquil flight ever. I guess we’ll see what Air India has on the burner for me when the flight takes off soon! Welcome Fall: Pumpkin Pie Ice!! !